Brown the chicken breasts in a medium-high skillet in oil or butter. Remove and place in casserole dish. Add the french onion soup and cook together to reduce liquid for 5 minutes. 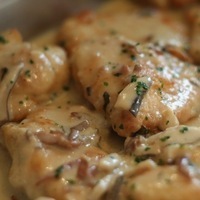 Pour sauce over chicken in the casserole dish, top with Swiss cheese and bake for 20 minutes at 350 degrees. Look yum! I like chicken.. just enjoy it a lot.